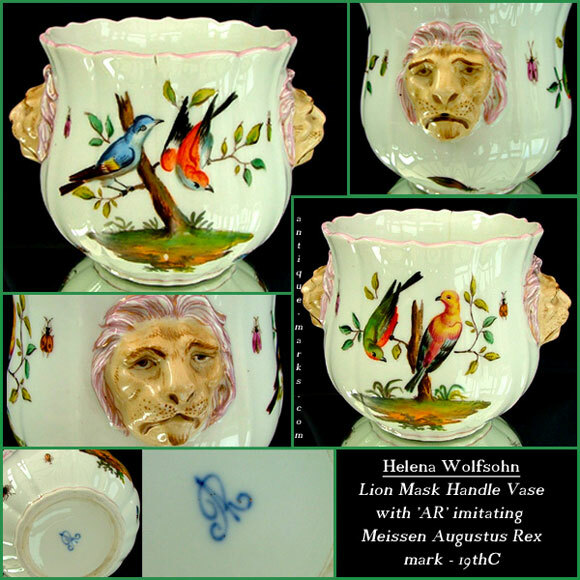 The Antique Marks Collection includes a fine Helena Wolfsohn vase bearing Wolfsohn’s AR mark in imitation of the Meissen, Augustus Rex mark. This very pretty Augustus Rex imitation is a twin handled vase of fluted form. The twin handles formed as beautiful, but quite naively painted lion heads. And; there are stunning hand painted ornithological subjects to front and rear with a selection of individual small insects placed around the vase, four to each side and one under each Lion handle. The almost perfect and very popular imitator, Helena Wolfsohn. Around the time this miniature Helena Wolfsohn vase was decorated, there were at least forty porcelain painting studios located near or in the city of Dresden, all decorating porcelain in the Meissen style. Other porcelain manufacturers and outside decorators quickly saw the advantage of including a pseudo AR mark on their own porcelain products. The AR mark was intended to be used only on items produced for the court of Elector August the Strong, founder of the Meissen factory and later reigning monarch of Poland. The mark was always applied by hand, in underglaze blue. Helena Wolfsohn wasn’t a porcelain manufacturer but rather a painting studio that decorated externally bought porcelain; mostly Meissen blanks. However, the AR monogram on early wares is often under the glaze and we can assume porcelain blanks were ordered with the mark applied before firing. The Wolfsohn mark is one of the best examples of the Meissen Augustus Rex mark you will find.